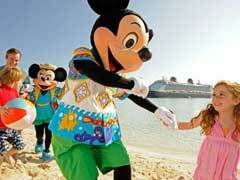 A Disney cruise vacation is chock full of family-friendly fun all in the spirit of Disney. Here are the 10 must-do things to do on your next Disney cruise. 1. On a Disney Alaska cruise don’t miss panning for gold in Skagway. Learn how the pioneers fared and take in the breathtaking sights on Adventures by Disney. 2. Disney cruise ships love to show off their characters, so meet them at designated meet and greet times (check the onboard schedule) and keep that camera ready because you never know when one will turn up. 3. Watch a movie in one of their beautiful themed theatres. These offer a bit of time inside and out of the sun and a chance to see first run movies all from the comfort of the ship. 4. On a Disney Bahamas cruise, make time to go swimming with the dolphins at Dolphin Cay. Here you can learn all about these beautiful creatures before you take to the water for playtime. 5. Take in a live show. Another thing that Disney excels at is their live shows. See Toy Story: The Musical, Disney Dreams, An Enchanted Classic or The Golden Mickey’s where various characters are up for awards (shows vary on each ship). All shows have early start times making them perfect for the whole family. 6. Disney Castaway Cay. The island in the Bahamas that is exclusive to Disney features plenty of fun things to do and an adult only beach where you can relax in the sun. You also get a beach BBQ included! 7. A Disney cruise vacation to Alaska can show you how totem poles are made and let you try your hand at carving one. 8. Studio Sea. On the Disney Wonder cruise ship (and others, too) you have the chance to sing, dance and play as a family at Studio Sea, a television themed entertainment center with all the bells and whistles of a real television studio. 9. Indulge in Pirate Night, a themed dinner, and rip roaring deck party with spectacular fireworks ideal for the whole family. Ahoy! 10. A Disney cruise vacation wouldn’t be complete without a goodbye party, and at the Till We Meet Event you can catch up with your favorite characters, crew members and cast for that last time before you disembark. Your Disney cruise vacation is simply a click away. Come and see the magic for yourself when you choose the experts at family vacations on land and now at sea as well.